MOORPARK, CA, July 11, 2017 -- TestEquity’s new catalog details the features, benefits, and specifications of the company’s complete range of eMRO (Electronic, Maintenance, Repair and Operations) and test & measurement equipment. 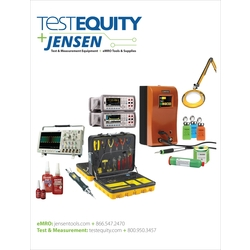 Moreover, the catalog integrates JENSEN Tools + Supply’s inventory to reflect their recent acquisition which has allowed TestEquity to gain strategic alignment and logistical competitive advantage to better support the electronics manufacturing, automotive, communications, and aerospace industries. This merger also provides robust Vendor Managed Inventory (VMI) custom solutions, JENSEN tool kits, and the expansion of TestEquity’s key product lines -- which include environmental chambers, workbenches and much more. With this catalog, electronics manufacturers, test & repair and field service professionals will quickly find the right solutions to minimize acquisition costs and increase productivity. The new 2017 master catalog features more than 15,000 products from more than 400 top brands including Brady, Chemtronics, Desco, Excelta, Kester, Loctite, Luxo, Metcal, Weller, Keysight Technologies, Tektronix, Rohde & Schwarz, Viavi, Fluke and TestEquity. "To increase our service and enhance your experience, this catalog has added numerous lines to provide you with a more comprehensive solution. This was accomplished with our acquisition of JENSEN Tools + Supply. Now we can provide you with a one-stop solution -- not only for your test & measurement needs -- but also for all of your lab or manufacturing facilities tools & supplies," said Dan Copsey, President and CEO of TestEquity. The new catalog is now available in two formats: an interactive, easy-to-navigate digital catalog for online browsing and a hard copy which can be requested on TestEquity’s company websites. TestEquity is a leading value-added provider of test & measurement solutions, eMRO tools & supplies and also designs and manufactures its own line of environmental test chambers in its headquarters in Moorpark, California. As a customer-centric business with highly trained and experienced product specialists across the United States, Canada and Mexico, TestEquity helps businesses by providing the industry’s top brands together with innovative products and unparalleled customer service.